Very interesting medium mountain stage. Starting from the most famous town of Assisi, the riders cross the Appennines again, this time towards east. The first climb of the day is Passo Cornello (GPM3, 8.4 km at 4.4%), a climb that only has one serious ramp, but that should be enough to define the breakaway of the day. A breakaway that has very good chances to make it to the end. After the descent, 40 km of descending false flat bring to the second climb of the day, Valico di Pietra Rossa (GPM3, 9.6 km at 3.7%), another very gentle climb, rarely over 6% gradient. The best however is about to start: the next difficulty is the intermediate sprint of Filottrano (in memory of Michele Scarponi), which lies after a 1.8 km wall with an average gradient of 7.8%. This wall features a 800m section at 11.8%, so it's pretty serious. It tops at 30 km to go, and it's the first of 4 walls, including the finish. 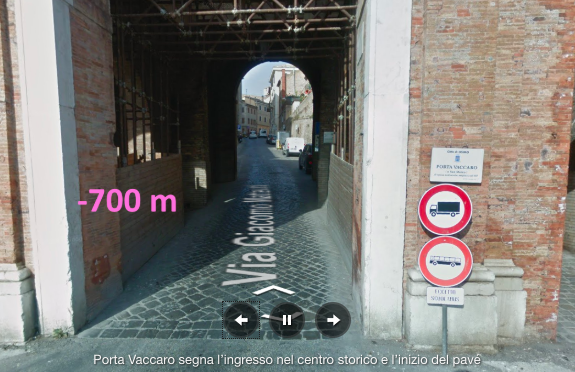 The second wall comes at 13 km to go, in San Paterniano, and it's roughly 1 km at 9-10% (no official info). After it, some rolling terrain will bring the riders to Osimo, where 2 walls are still waiting. 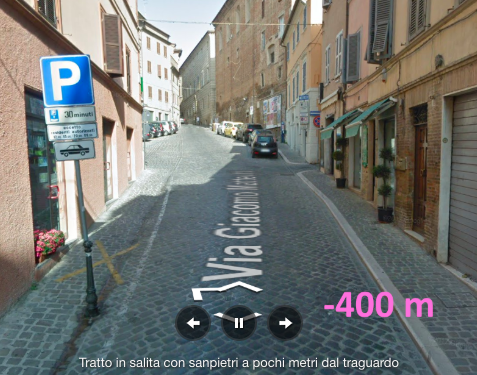 The first is perhaps the most interesting: Via Costa del Borgo is a 300m cobbled stretch at 13.2% average, coming at 5 km to go, 2 of which are a descent. At the bottom, less than 1 km of flat will lead to the final wall. Osimo (GPM4, 1.8 km at 6.4%) includes a real wall of 500m at 12.4%, followed by 1.3 km of easier climbing (still featuring some serious ramps), that flattens out towards the finishing line. The only interesting section is 1.5 km at 7.8%. Not a bad climb, but nothing special, either. Very shallow gradients throughout. And, no profile. It's no GPM, but the organizers provide a profile, so here it is. Profile on the final km picture. This is a very cool stage that would have the potential even for GC attacks, if there were favourites that are good in this scenarios. Unfortunately, I don't think there are, so on the GC side nothing should happen. Still, the fight for the stage win will be fun. How's the weather supposed to be? People will feel stage 10 in their legs, we could see gaps between the gc contenders on the finish line. A good chance for Yates to grab another few seconds. Every second could be vital. 3 seconds per km in a TT means he already has 13km of the TT covered. I think Mitchelton–Scott is too weakened after today to chase all day. I expect a large break, and given how Wellens sat up from the beginning today, he'll probably be there. Edit: And I think it's the perfect time to give the jersey to someone in the break. Konrad, Betancur, Henao, Schachmann, Geniez, & Gonçalves, this is your chance! Last edited by Netserk on 15 May 2018 17:38, edited 1 time in total. Lopez likely to bleed more time. I really really like this stage design. I wonder who would want to chase except for Mitchelton. LottoNL for Battaglin? In the stage originally revealed they had a much harder first climb which was higher and looked a lot steeper. It's a pity they changed that, otherwise lots of riders might have gotten into problems there after a hard stage like todays. This definitely is one for the breakaway, though this has been stated a few times - I expect MS will be happy for the break to get 15 minutes - Though the first 30-50 kms could be ridden quickly because who MS want in the break will be different from other teams. Gigs_98 wrote: In the stage originally revealed they had a much harder first climb which was higher and looked a lot steeper. It's a pity they changed that, otherwise lots of riders might have gotten into problems there after a hard stage like todays. Formolo, Oomen and Henao should join it too. It can be very good. Alexandre B. wrote: Lopez likely to bleed more time. Next high placed GC victim tomorrow. Who will it be? Rollthedice wrote: Next high placed GC victim tomorrow. Who will it be? Has nobody noticed we also lost Meintjes today? He could've been very dangerous..
Maybe Dumoulin will suffer a bit from his crash but I expect nothing. Can team cars even go through there? Dekker_Tifosi wrote: A good chance for Yates to grab another few seconds. Every second could be vital. 3 seconds per km in a TT means he already has 13km of the TT covered. By the way I just looked it up and in the original stage design the first climb was instead a 5km@11% brute. There also would have been a side of the climb which is 7km@7% but most of it on sterrato. I still think it's a bit sad they didn't use one of these two climbs as it would have made the first half of the stage a lot more exciting. Moreover that climb would at least have been a cat 2 climb, so more mountain points available. This could be the best thing possible for him. He might have to learn to do something other than fall back as slowly as possible if he wants to salvage anything from his race, rather than just use a middling GC position as something to defend, and if so, in the long run he may be far better for it.